Large diaphragm microphones should come first when the idea of starting a home recording studio hits you. During this time, you need not spend much on a bunch of studio recording microphones when one piece can be used in an array of projects. As we mentioned in our flagship write-up on Different Types of Microphones and Buying Guide, large diaphragm mics (LDC) have diaphragms measuring 1-inch or larger. Though quite a small difference from SDC’s (1/2 or more but less than 1 inch) diaphragms, the LDC mics tend to be more or equally sensitive to SDC mics. They also portray a positive difference in their frequency response in that their low-frequency end is a tad deeper and authoritative for vocals, drum sets, and other uses. Large diaphragm microphones can be rudely expensive. Take the Sony C800GPAC, for instance. This piece is likely to make a 10-grand dent in your bank account. Though these mics claim to be the ultimate when it comes to studio microphones, we wouldn’t recommend them to a blooming home recording studio. However, if you feel that you have some money to spend on high-end studio equipment, why should we stand in your way? But for now, here the 6 affordable large diaphragm microphones below the 1500-dollar price point. If you’re searching for the cheapest large diaphragm condenser microphone, the Studio Projects B1 (at slightly above $100) is the lowest we can guarantee your safety. Studio Projects are a force to reckon with in the competitive world of microphones. This is hugely because of their determination to offer the nuanced German-microphone sound quality at half the price. Their mics are designed in the USA, built in Beijing, and then shipped back to California for inspection and quality control. The B1 isn’t Studio Projects’ most expensive large diaphragm condenser microphone. Pricier models have come but still, find it hard to displace the B1 from its position. This is a renowned large diaphragm mic when it comes to producing the finest quality of instrumentation and vocal recordings. So, what makes Studio Projects a total bargain in this arena? First, you can bet on it if all you need is a versatile condenser microphone for several studio applications. Amongst its other notable features are the -10dB and -20dB selectable pads. You can select any of these depending on how loud your sound sources are. The 75Hz and 150Hz Filters, on the other hand, make it easy to rumble and hum on the low-frequency end. Moreover, the B1 has a transformerless design and uses an efficient 1’’ 3 um pressure gradient transducer. The Studio Projects B1 above is a recommendable entry level LDC microphone for the money. However, if you can, I would highly advise you to save a few more bucks and go for this killer Audio Technica AT2035. It’s a stellar large diaphragm microphone with finesse. The Audio-Technica is an upgraded version of the AT2020 which sells at almost half its price. The AT2020 is amongst the best USB large diaphragm condenser microphones and a good value (by the way) if you’d like to go that way. One of the AT2035’s strongholds is its ability to handle extremely high SPL before distorting. For precision, this microphone can withstand 148dB of SPL without the pad, and 158dB with the pad switched on. That’s the highest SPL handling capability in this page! Frankly, very few condenser microphones will offer this strength at this price range. Similar to our first option, Audio-Technica AT2035 also has a high pass filter switch used to extend the low frequencies and a 10dB pad. At its price, the AT2035 is just awesome regarding sound quality. Its cardioid polar pattern offers advanced isolation of unwanted sounds from the sides and rear. This mic is also hyper-sensitive and has extremely reduced self-noise. Moreover, you get a free shock-mount, a pop filter, and an XLR cable. When hunting for the best microphones, one thing is always certain; the deal gets better and better as the price goes up. That’s what is happening in this list. However, the Rode NT1A boasts one vital feature that our #1 item misses; the incredibly low self-noise. At 5dBA self-noise, the NT1A boasts the world’s most coveted quietest microphone title. Rode NT1A is also our favorite mic in our list of the best condenser microphones. This is an advanced model of the legendary Rode NT1. The NT1A is an XLR LDC mic featuring a metallic nickel-plated body and a sturdy wire mesh grill. Though not so sturdy for live on-stage performances, its state-of-the-art surface-mount electronic circuitry, 137dB SPL capability, and unbeatable low distortion make it the best LDC microphone for home studio recording. The Rode NT1A condenser microphone is a side-addressed microphone utilizing pressure gradient acoustic principle. Its 20Hz-20kHz frequency response is well suited to fit a wide array of recording tasks without hiss building up. One reason we at Studio Gear Experts recommend the Rode NT1A is because it comes in a ready-for-professional-recording package. The package includes the mic, studio-grade pop shield, shock mount, 20-ft mic cable, dust cover, and a free DVD full of recording tips. Bluebird is Blue’s latest addition to its series of killer mics. Well, the mic isn’t new on the market as such. However, a few years back, it was only available in a package of several other products from Focusrite and Digidesign. As such, finding it on the market as a single item is worth celebrating. The good news is that it comes with an impressive kit comprising a shock mount, microphone cable, and bespoke pop filter. These additional tools rank it highly in the list of the best large diaphragm condenser microphone for starters and experienced musicians alike. Since its birth, Bluebird has singled out itself as the only versatile microphone from the Blue Latvian Universal Electronics (BLUE) Company. This large diaphragm condenser microphone can handle almost any task thrown its way. In case you’re in need of the best large diaphragm condenser microphone for vocals, guitars (electric and acoustic), drum, strings, piano, and percussive instruments, Bluebird is all yours. Bluebird condenser microphone sounds just as awesome as it looks. It has a sensitivity of 27mV/Pa and a maximum SPL of 138dB with 0.5% distortion. It also has a flat frequency response of 20Hz-20kHz. Its mid and upper-mid ranges appear smooth while its top is detailed and airy. Our second option in this list of the best large diaphragm microphones is the Avantone Pro CV-12. This is a highly versatile piece of instrument that brings the good old memories of the vintage tube mics of the 50s and 60s. The CV-12 is a nice looking condenser mic featuring an attractive red metal-flake finish that mimics the renowned and the original AKG C12 of 1953. One thing that clearly stands out in this mic’s design is Avantone’s desire to deliver professional performance only available with other high-end mics but at a greatly reduced price. For instance, the 9 polar patterns with this mic offer you endless options on how you can put the mic into use. This condenser microphone utilizes dual gold-sputter Mylar capsules with numerous directionalities including cardioids, figure-8, omnidirectional and another 6 options in-between the major directionalities. This is quite an interesting feature that allows you to determine the amount of room ambiance that you want to include in your recordings. For vocals, this large diaphragm tube microphone has lots of warmth that add body to your vocals while still smoothing out the high frequencies. It also boasts a -10dB switchable pad that is useful when recording high-volume sources including drums. Scooping our number 1 position of the best large diaphragm microphone under 1000 dollars is this Chinese made M-Audio Sputnik. M-Audio is the same company that brings you the M-Audio BX8 D2, a hitter in our list of the best studio monitors. Like the Avantone Pro CV-12 before it, the M-Audio Sputnik is a multi-pattern large diaphragm microphone. At first glance, you’ll doubtlessly like its elegant classic vacuum tube design. Its body is a high-quality bright-plated machined-brass that gives it a unique retro and distinctive look. This impressive design is further boosted by its round capsule basket. Uniquely, the sound waves go through twin layers of steel grille before hitting the capsule which has also been shock-mounted for clear and clean sound performance. The 2-layer grill also contributes to the capsules durability and pickup patterns. Talking of sound performance, M-Audio Sputnik has been compared to the untouchable Neumann U47 and the AKG C12. This workhorse has 18dBA of self-noise and a maximum SPL handling capability of 132dB. Moreover, the Sputnik boasts a 1-inch 3 um thick diaphragm that offers -30.5dBV sensitivity. This doubled with the switchable 3 polar patterns, 10dB pad, and 20Hz – 20,000Hz frequency response is all you need for your vocals, guitars, and piano among other applications. 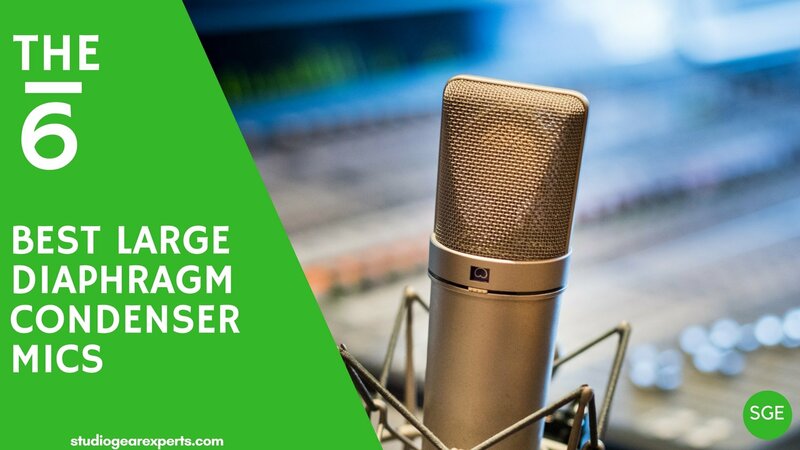 What large diaphragm condenser microphone fits your projects? Have you tried any of the above mics? Do share your experience with it in our comments section.